Phone Verification is an important, high-confidence step in your registration flow to verify that a user has the device they claim to have. Adding phone verification to your application will greatly reduce your number of fraudulent registrations and protect future application users from having their numbers registered by scammers. This quickstart guides you through creating a PHP, Laravel and AngularJS app that requires a phone verification step with Twilio Verify to create an account. Two channels of Phone Verification are demoed: SMS and Voice. Click the eyeball to reveal your Production API Key and copy it somewhere safe. You will use the API Key during the application setup step below. To complete the quickstart today we'll use PHP 7.0+, Composer, MySQL, and the Twilio PHP Helper Library. Let's walk through each one now - but feel free to skip if you have already installed one. When doing web development in PHP, we strongly suggest using Composer for package management. This quickstart relies on Composer to install the PHP Helper library. You can find manual Twilio PHP installation instructions on the PHP Helper Library page. While Twilio's Verify API doesn't return user information you'll need to store, to continue working on the app after this Quickstart you'll want a database. For this demo, we built our user database on top of MySQL 5.x. When installed, start MySQL. If you're using the default MySQL credentials (as below), create a schema account_security with user homestead and password secret. Install PHP, Composer, Laravel and MySQL. Assuming your API Key is correctly entered and the command above executed correctly, you'll soon get a message that the app is up! And with that, your demo app is protected with Twilio's Verify phone verification! You can now log out to try the other channel. Your demo app is now keeping hordes of fraudulent users from registering with your business and polluting the database. Next, you should check out all of the variables and options available to you in the Verify API Reference. 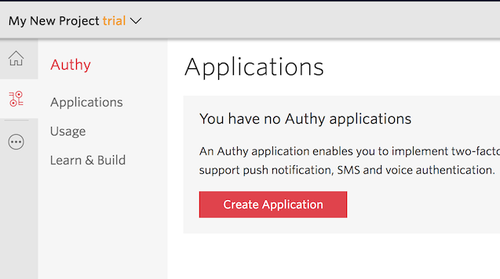 Also, for protecting your customers in an ongoing manner (with this same codebase) try the PHP Authy Two-Factor Authentication Quickstart.